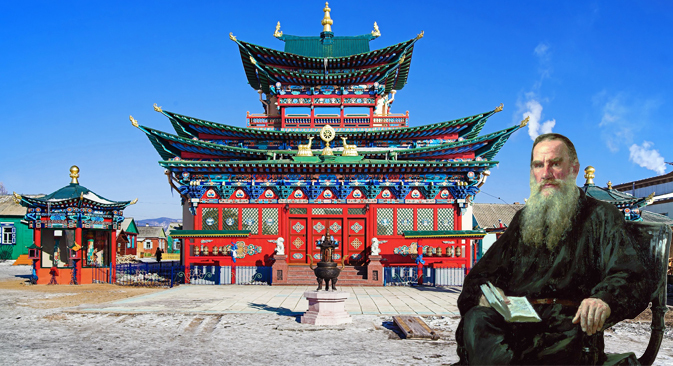 In the latter part of his life, Tolstoy was considerably influenced by philosophies from India and other parts of Asia. When Leo Tolstoy was 19, he was admitted to a hospital in Kazan for a minor illness. There he met and befriended a Buddhist monk who was recovering after suffering a violent assault at the hands of a robber. The young Tolstoy was astonished by the fact that the monk had not fought back, as he adhered to the Buddhist principle of non-violence. This early experience had a profound effect on the writer, who maintained an interest in Buddhism and other eastern teachings throughout his entire life. Like most people born in 19th-century Russia, Leo Tolstoy was baptized into the Russian Orthodox Church. However, religion didn't play a big role in his youth, and it was only after finishing his masterpiece “Anna Karenina” that Tolstoy began to feel what he described as an existential crisis. Life, mankind and the Universe all seemed futile and meaningless to him. Tolstoy described this crisis in detail in “A Confession,” an autobiographical account of his emotional struggle. Written in 1879-80, when Tolstoy was in his mid-50s, the book explores his childhood disillusionment with religion, his mastery of willpower, and how he had achieved wealth, fame and status only to feel that his life was meaningless. Tolstoy was initially drawn to the Russian Orthodox Church, but he soon decided that Christian churches were corrupt and falsified Christ's message. He believed that he understood the real teaching and began to propagate a new faith. While this new faith was not overtly Buddhist, many scholars see it as the start of the writer's move towards eastern religions and philosophies. Tolstoy referenced Buddhism directly in “What I Believe” (1883), “A Confession” (1884), and “What Then Should We Do” (1886), mentioning the Buddha alongside spiritual and philosophical figures such as Moses, Mohammed, Socrates, Zoroaster and Christ. Tolstoy continued publishing on Buddhism towards the end of his life, including works such as an article called “The Buddha” for his anthology “The Circle of Reading,” and a translation of “Karma,” written by American Paul Carus. He turned vegetarian, became a champion of non-violence, and generally tried to live a simpler life – choices that show an affinity with Buddhist practise. However, this was not the only eastern religion that influenced Tolstoy's beliefs: he also took an active interest in Hindusim. According to the English academic and Sanskrit scholar Bruce Wilkinson, “Tolstoy used to read the Vedic Magazine at his estate in Yasnaya Polyana.” He explains that “there are extracts from the Vedas and Upanishads (ancient Sanskrit texts) in 'The Circle of Reading'.” Tolstoy also read the two epics, “The Ramayana” and “The Mahabharata,” which have become central to national identity in many countries across Southeast Asia. In “A Letter to a Hindu,”where Tolstoy replies to letters from the editor of the Free Hindustan journal seeking his support for the end of British rule in India, the Russian writer repeatedly refers to the Vedas, and shows a clear understanding of the sayings of Krishna. Tolstoy also makes references to Swami Vivekananda, one of India’s greatest philosophers, and emphasizes the importance of religious principles in the freedom movement. “From your letter and the articles in Free Hindustan, as well as from the very interesting writings of the Hindu Swami Vivekananda and others, it appears that, as is the case in our time with the ills of all nations, the reason lies in the lack of a reasonable religious teaching which by explaining the meaning of life would supply a supreme law for the guidance of conduct and would replace the more than dubious precepts of pseudo-religion and pseudo-science with the immoral conclusions deduced from them and commonly called 'civilization,'” Tolstoy wrote. This can be seen as a swipe at both the British Empire and Tsarist Russia. Tolstoy’s letter was widely circulated and was eventually read by Mahatma Gandhi, who was a young legal representative in South Africa at the time. Gandhi appreciated the letter so much that in 1909 he wrote to Tolstoy seeking advice and permission to republish the article in his South African newspaper Indian Opinion. The two men began exchanging letters and grew close through this correspondence. Gandhi was inspired by the Russian philosopher's ideas and set up a cooperative colony called Tolstoy Farm near Johannesburg. In his diary, Tolstoy wrote that Gandhi “is a very close person to me, to us. He thinks that the strongest resistance is passive resistance.” Indeed, the Tolstoyan ideal of non-violence and passive resistance was the backbone of the Indian independence struggle. Tolstoy was also fascinated by Chinese philosophers, particularly Lao Tsu, the founder of Taoism. According to Rosamund Bartlett’s “Tolstoy: A Russian Life,”Tolstoy’s follower Yevgeny Popov translated Lao Tsu’s “Tao Te Ching” (The Way and its Power) from German into Russian; the original dates from the 6th century BC, but Victor von Strauss had produced a German translation in 1870. Tolstoy checked the translation and wrote an introduction explaining that the basic teaching in Lao Tsu’s book was the same as in all great religions. Bartlett writes that Tolstoy was drawn to Lao Tsu’s “lapidary insights, which accorded so much with his hard won beliefs.” Central to these beliefs is the idea of living a harmonious, principled existence, which is also the basic tenet of the Chinese religion. It is not exactly clear when Tolstoy discovered Taoism, but “War and Peace” (1869)contains elements of its philosophy. The book describes how fate controls history, and how people have little control in the sequence of events while playing their part in the grander scheme of things. As per Taoist principles, all someone can ever truly control is their mind. The idea of destiny in the work is shown through the relationship between the Russian Prince Andrei and Napoleon Bonaparte, two characters whose fate is ultimately out of their hands. Andrei used to be an admirer of Bonaparte but becomes his enemy and unsuccessfully tries to kill him at the Battle of Austerlitz; following this he catches a glimpse of the emperor's silhouette and is elated in his semi-conscious state. Tolstoy goes on to describe the later meeting between the two: “Looking into Napoleon’s eyes, Prince Andrei thought about the insignificance of grandeur, about the insignificance of life, the meaning of which no one could understand, and about the still greater insignificance of death, the meaning of which no one among the living could understand or explain.” In a Taoist reading, both the mighty French emperor and the proud Russian prince are mere players in the Tao – their seeming grandeur nothing more than an illusion. In “War and Peace” Tolstoy shows that great individuals' ability to control circumstances decreases even as they become more important. Hence Napoleon cannot control his French army after a certain point in Russia. The emperor is imprisoned by his false belief in his own importance. In contrast, a man like Pierre is truly free because – despite being physically imprisoned by Napoleon’s army – he has control of his mind and does not seek total control over others. How much Buddhism, Hinduism and Taoism influenced Tolstoy is a matter of interpretation, but their principles are certainly present in the philosophy he created, known as tolstovstvo. Its core concept was that mankind should live in peace, harmony and unity, which is a very Buddhist ideal. The same is true of his rejection of luxury and his stance against the exploitation of peasants. However, he also supported the idea of surrendering to the inevitable, predestined flow of life’s events – a concept familiar to anyone who has read “Tao Te Ching.” Like all great thinkers, Tolstoy was able to assimilate his influences and create a unique philosophy of his own.